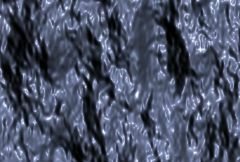 Creates an abstract texture by applying a EmbossShiny effect to a procedurally generated noise texture, then combines the texture with a background clip. Back: The clip to combine the texture image with. This may be ignored if the Combine option is set to Texture Only, but the output clip will default to the same length as this clip. Frequency: Default: 2, Range: 0.1 or greater. Frequency Rel X: Default: 1.5, Range: 0.01 or greater. Octaves: Integer, Default: 5, Range: 1 to 10. Light Dir: X & Y, Default: [0.2 0.2], Range: any. The direction vector for the light source. Surface shading is calculated using light from this direction shining onto the generated bump map. This parameter can be adjusted using the Light Dir Widget. Bumps Scale: Default: 2.5, Range: any. Hilite Brightnss: Default: 0.5, Range: 0 or greater. Hilite Size: Default: 0.5, Range: 0.1 or greater. Surface Color: Default rgb: [0.75 0.75 0.75]. The color of the surface. The final color is affected by both this and the Light Color. Noise Smooth: Default: 0, Range: 0 or greater. Smooths the noise texture before applying the Emboss. This can be helpful in removing unwanted artifacts from the noise generation algorithm.